Yet another year and Milan Design Week has finished, leaving all of us extremely tired and overwhelmed with the massive amount of design that is spread over the Salone and the city exhibitions, the Fuorisalone. One week and tons of coffee to overcome design-caused sleep deprivation after, I feel recovered enough to reflect on everything seen, experienced and photographed. To start with, I'd like to point out a fact which becomes more poignant every year; Milan Design Week seems to be decaying. Is it the crisis? I don't know; I feel reluctant to blame absolutely everything to the financial recession, as it seems to be the rule now. Don't take me wrong, it is not my intention to trivialize the economical dip, which indeed has had many negative effects, especially on the design industry, so prone to be put on hold when numbers don't match and short term fixes are required. But it seems to me that creativity is precisely one of those rare skills that are mostly benefitted from constraints. Moreover, creativity, when backed up with endless budget, is not witty, not fun, and has not so much merit in it. And I didn't see that much of that at Milan. Old formulas and ways of doing were ubiquitously present, and although that meant we got to see craftsmanship perfected, it didn't make it very much exciting. Extremely beautiful? Yes; I cannot deny I was extremely amazed by the level of aesthetics and execution excellence I saw there. But I wasn't that much challenged. Marcus Fairs did point out in its opinion article at Dezeen that the cause might be that Milan is, slowly, losing its hegemony as the absolute must-go place in the world if you want to know what's going on. He points out at the very poor organization of the festival itself as the main cause for this. And I must say that he has reflected a general sentiment that seems to be present, to a greater or lesser extent, in every person I bumped across at Milan. He definitely has a point, although in my opinion an undesigned design fair is not the only reason for disappointment in Milan. There is something else which compromises the reign of Milan as the absolute design capital: it doesn't reflect the full meaning of the word design. I admit that I have to say that because, as a design strategist myself, I feel somehow my own practice is not reflected there. Design is much broader than just product or furniture design, and that becomes true the more we progress in time. New developments are supported by User Interface designers working on the best interactions we can have with our ubiquitous machines, the shift towards experiences and services are delivered by means of User Experience professionals, and new emerging values in our fast-changing society are met by Innovation and Strategy designers. Today, when design finds itself expanding its meaning more than ever, from the craftsman on the industrial era to that of making sense of things, Milan fair should be renamed, as it is no longer about design, but product design and furniture. And if Milan is not the place to go if you want to catch a glimpse of all that design world that happens beyond the boundaries of furniture, where to go? Well, answering that question might take as well a whole new article. Anyway, my view is not that apocalyptical as it might have come across my last two paragraphs; I just believe in introducing a bit of criticism to make sure we never sit too comfortably in our ideas and fall victims of conformity. It wouldn't be fair to all the good things I've seen there not to make this point clear. And, despite all, yes, I've seen a lot of beautiful, inspiring things. So many that we have been extremely busy trying to condense it all in one Pinterest board. A few highlights? Well, list is short, but intense. I absolutely loved Moooi, who knows exactly why those kinds of fairs are there: to make a lasting impact and leave visitors with a wow feeling. A beautifully staged show that made you feel as if you were entering another world (you can check it for yourself in their virtual tour here). Crafted to the very details, from the amazing, subtly provoking pictures of Erwin Olaf - a long term collaborator of the brand - to the detailed orchestration of their interiors - we could even find cracked-on-purpose walnuts matching the colour palette of their furniture. All seasoned with really good music, because at the end, what you want is to have that party feeling, right? Well, congratulations to Moooi - we didn't only love its extensive new collection, but also the world they made us dream. Tom Dixon and its recent collaboration for Adidas, The Capsule, was one of the few things which explored innovation - in this case, how industrial techniques can cross-pollinate other fields, as fashion. 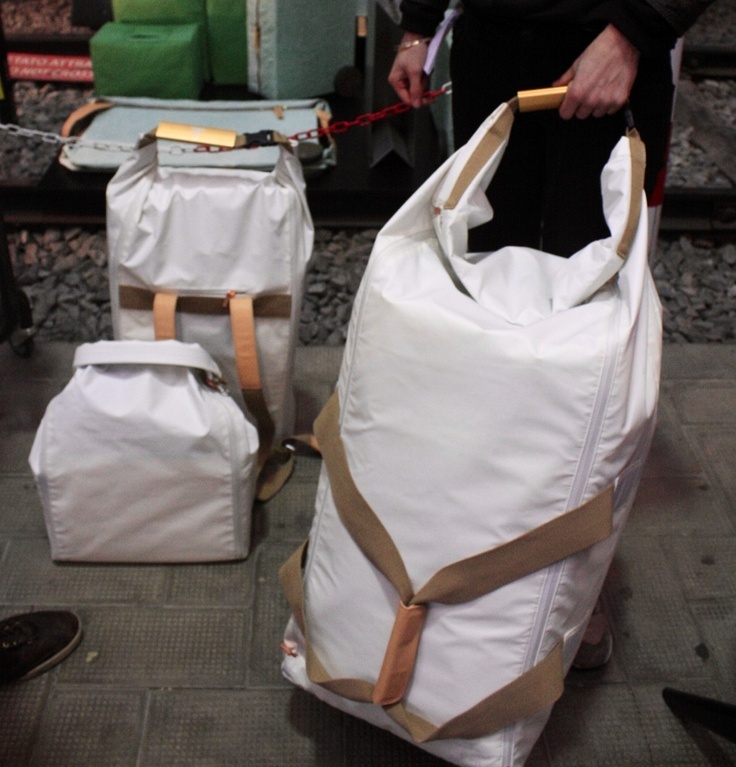 He presented an intriguing collection of clothing and bags dedicated to the frequent traveller which derive their multifunctionality from innovative materials and process used in other industries. A flat-packed, foldable suitcase, a coat that turns into a sleeping bag, and other impressive pieces that, if not in line with Italian elegance, were indeed thoughtful and aesthetically pleasing. In 2011, Benjamin Hubert was the unofficially-declared Milan Design Week designer - his products were ubiquitous, both at the Salone and in the Fuorisalone. This year we can safely say that Michael Anastassiades has won the title: we found him in every review, every booth we could find; definitely a designer to keep an eye on. His work for Flos was one of the most commented pieces of the week, and his style, minimalisticly witty, serenely kitsch, was the best example of the revival of Art Deco that seemed to emerge. 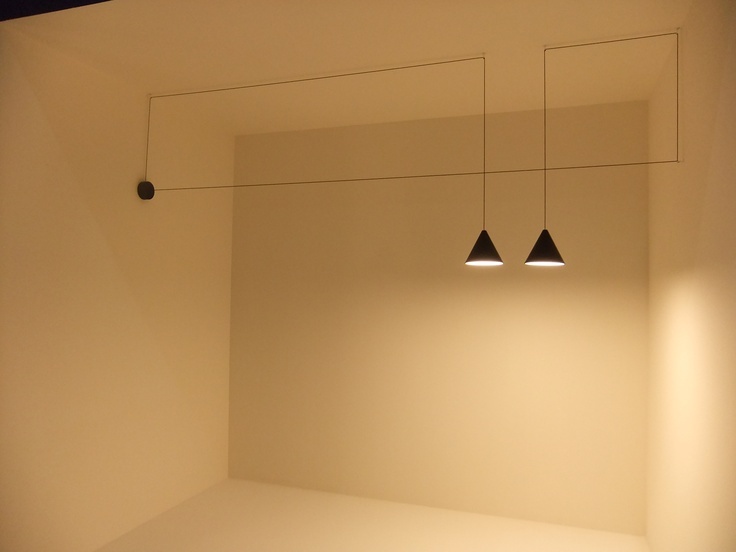 As minimalistic as it can get: Anastassiades' String Light for Flos. Spazio Rossana Orlandi, once more, reaffirmed its position as the safe place to go should you be looking for that mind-blowing piece you haven't seen yet. Among many others and framed in the always-inspiring Spazio, we discovered the most beautiful thing Milan had to offer: the Sygyzy lamp by Os and Oos: a beautiful piece of art that shows an eclipse-like effect cleverly emerging from understanding a basic principle in lighting, polarized filter. A true statement, beautiful from bottom to top; we loved everything from the light effect to the cubist aesthetics. Wallpaper Handmade was indeed one of the best examples of what Milan had been this year. Delightfully crafted products which show mastery of form, proportions, materials and colours, nothing too far from what we knew already, just much better. The highlight? Paul Cocksedge's quest for innovation wrapped in a shoe heel: a new methodology to form wood while controlling its strength properties along the part. And they looked beautiful, too. Paul Cocksedge reinvents the shoe heel – and makes it damn beautiful too! 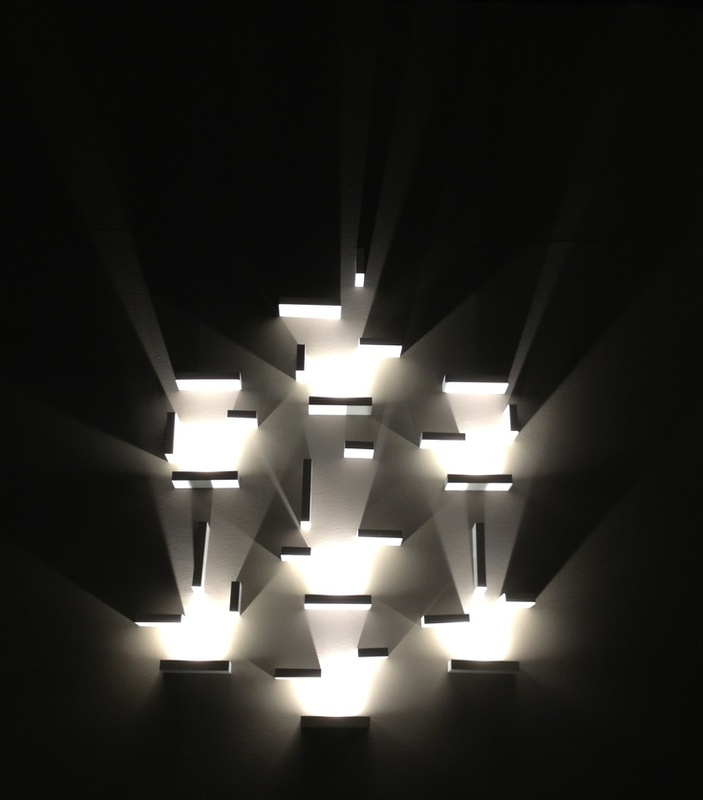 Last but not least, Euroluce. We have seen a lot of what we had already seen in Euroluce´s 2011 edition. Brands are playing it safe, and Euroluce was the place to realize this fact. Our winner was clearly Vibia: a quite sizeable new collection, elegant mise-en-scène, knowledge of shadows and one of the only examples of extending lighting to new services empowered by new technologies: their online application to create projects, easy and intuitive to use. A beautiful game of light & shadows at Vibia stand at Euroluce. Short and sweet, this is, of course, just where my eye and heart were during last show. There were plenty of visual treats across Milan, and should you be hungry for more, don´t forget to check the #WeareinMilanPinterest board, where we posted all the things we loved.